* Martin/F. Weber Co.'s line of professional artists' brushes carries the name that artists recognize and trust: Permalba®.Our Professional Permalba® line offers brushes in either pure red sable or the best interlocked white bristle in the most popular sizes and styles: brights, rounds, filberts, flats, fan and script liner. * Artists appreciate the beauty of these striking, hand made brushes with elongated iridescent pearl handles and seamless nickel plated brass ferrules. 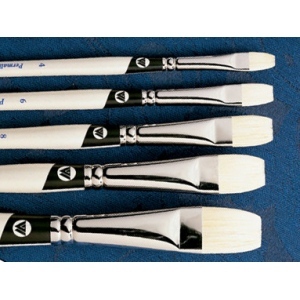 * Permalba® professional artists brushes are exquisite, precision painting tools offering the artists ultimate control, dependable, consistent performance and long life. * Brushes are available uncarded for open rack placement.